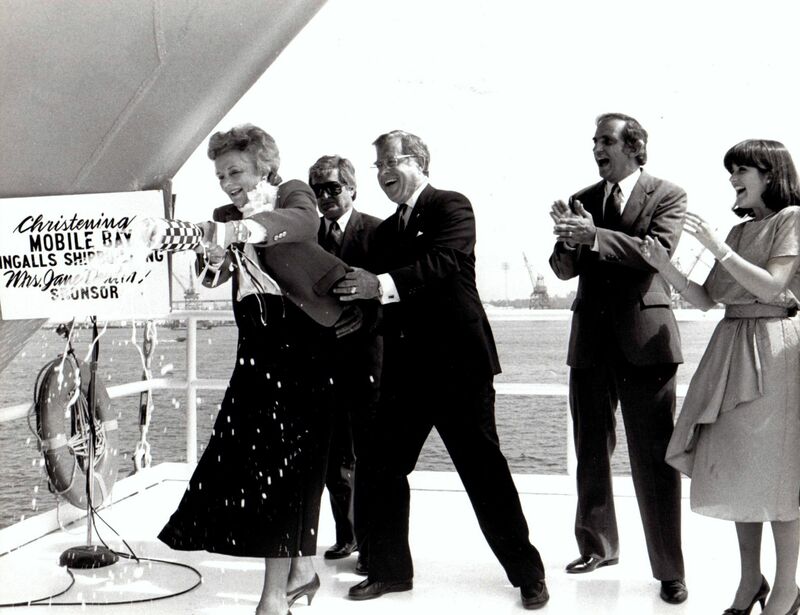 Mrs. Jane Denton Christening Mobile Bay (CG 53). 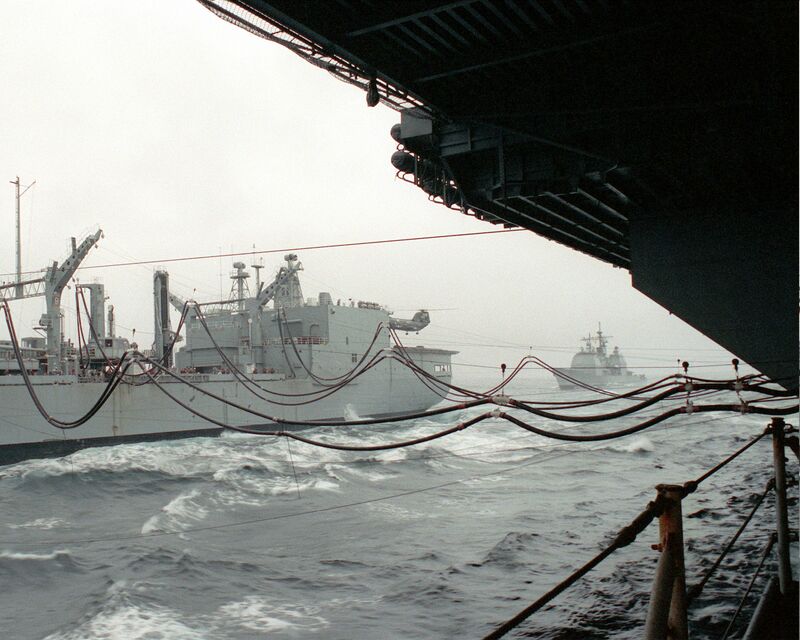 15 September 1988 - Fuel lines span the distance between the replenishment oiler USS Milwaukee (AOR 2) and the aircraft carrier USS Forrestal (CV 59) as a replenishment at sea is conducted during the allied forces exercise Team Work '88. 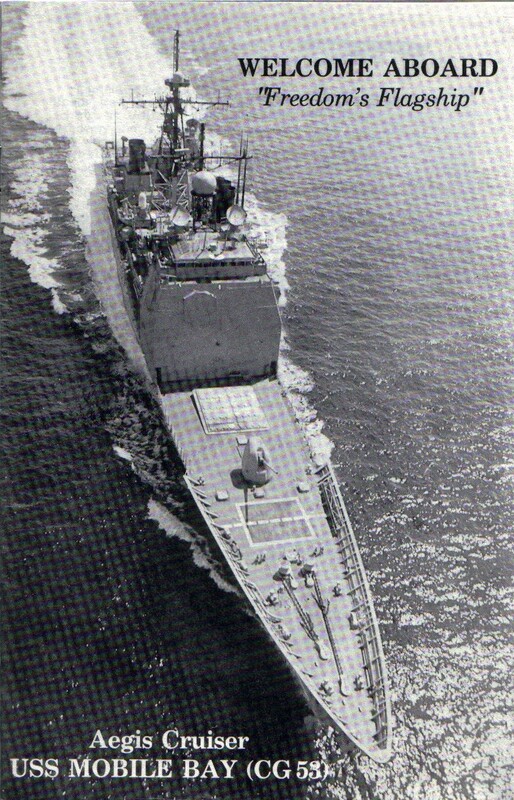 Sailing astern of the Milwaukee is the guided missile cruiser USS Mobile Bay (CG 53). At sea aboard the USS Constellation (CV 64), 12 February 2003 - An F/A-18 Hornet from the Vigilantes of strike fighter squadron One Five One (VFA-151) is launched from the USS Constellation. 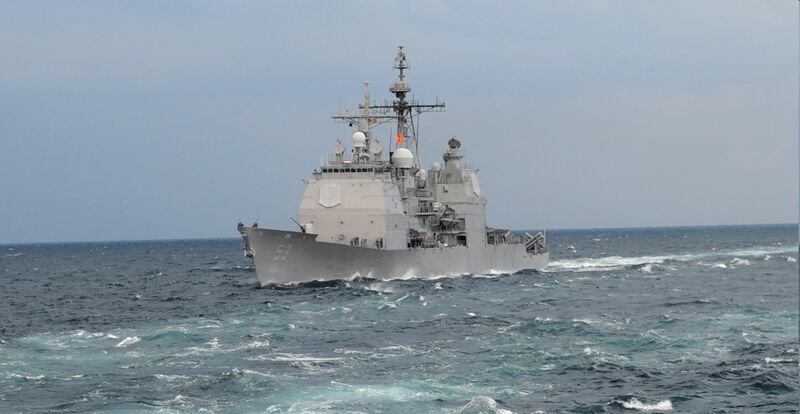 As the Guided Missile Cruiser USS Mobile Bay (CG 53) passes. 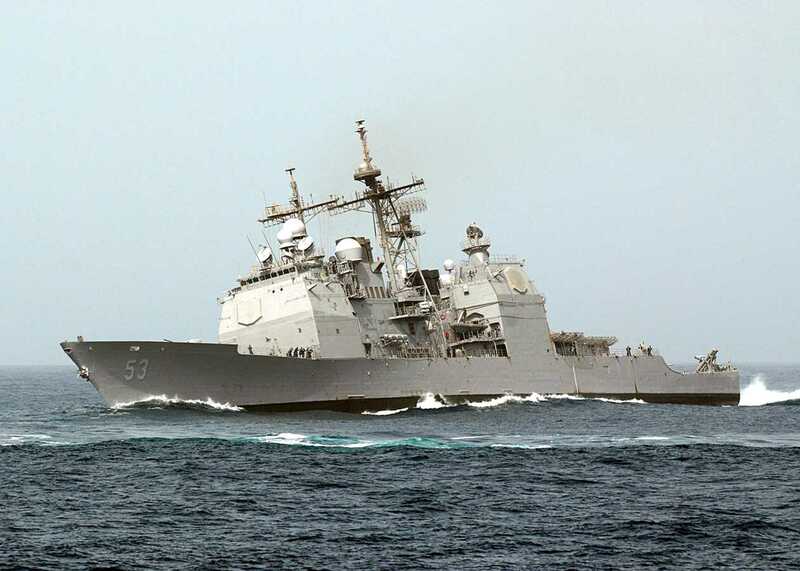 U.S. Navy Photo by Photographers Mate 2nd class Felix Garza Jr.
25 April 2003 - The guided missile cruiser USS Mobile Bay (CG 53) makes her way down San Diego Bay to Naval Station San Diego. 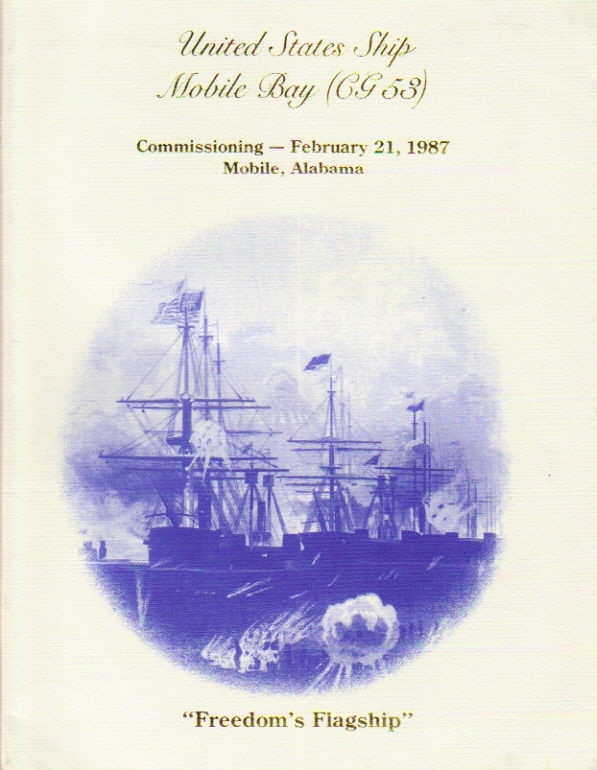 Mobile Bay was deployed in support of Operation Iraqi Freedom. 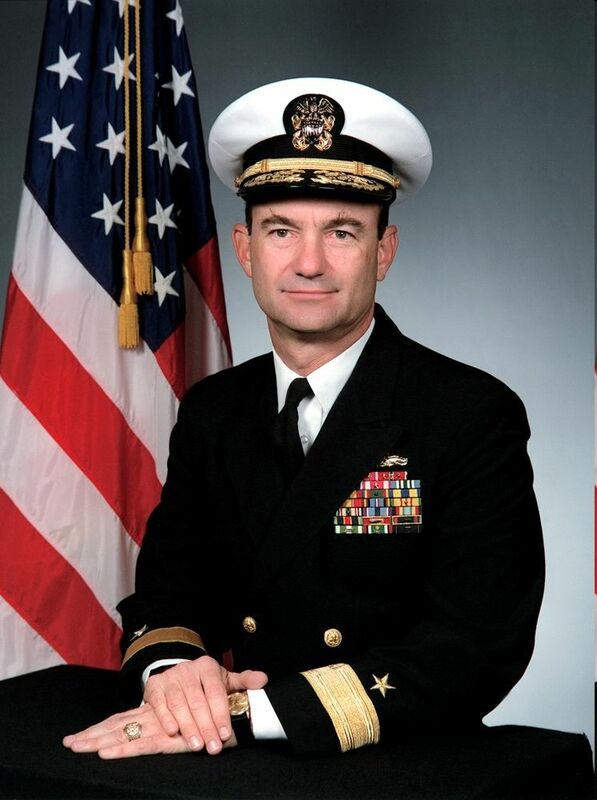 Operation Iraqi Freedom is the multi-national coalition effort to liberate the Iraqi people, eliminate Iraqs weapons of mass destruction, and end the regime of Saddam Hussein. U.S. Navy photo #030425-N-1144C-002 by Photographer's Mate 1st Class (Ret) Chuck Cavanaugh. 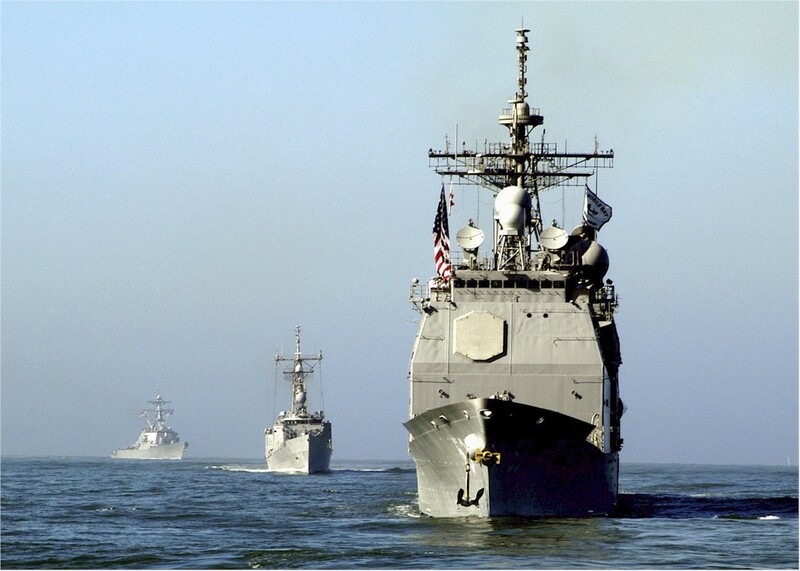 San Francisco, Calif., 11 October 2003 - Ships in formation parade across San Francisco Bay to commence Navy Fleet Week 2003 festivities. 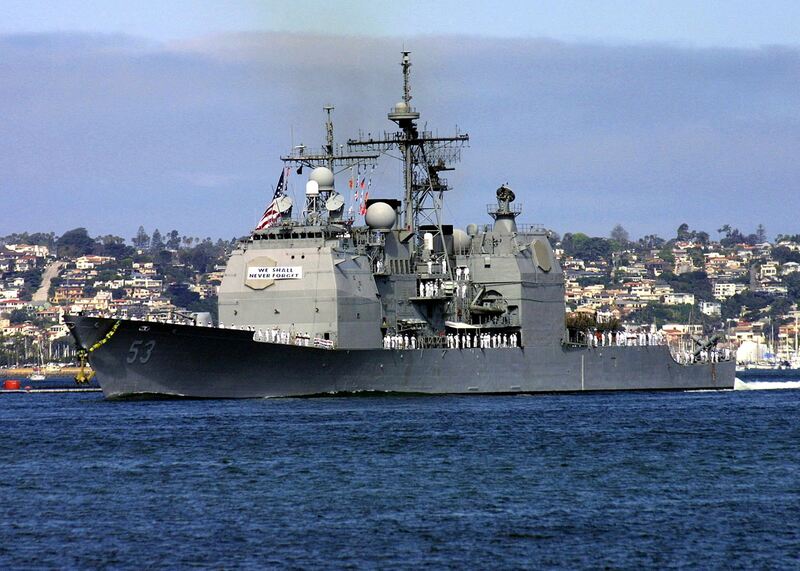 This marks the 22nd year of the Navy Fleet Week of the city by the bay. 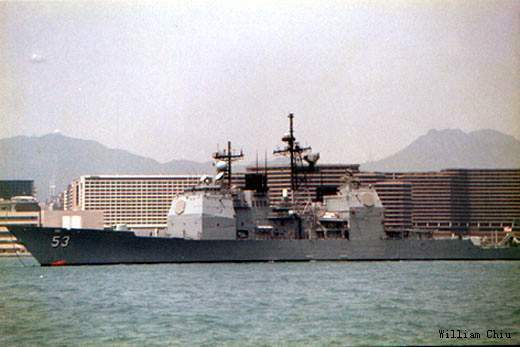 Pictured fore and aft, the Ticonderoga-class guided-missile cruiser USS Mobile Bay (CG 53), the Oliver Hazard Perry-class guided-missile frigate USS Thach (FFG 43) and the Arleigh Burke-class guided-missile destroyer USS Hopper (DDG 70). 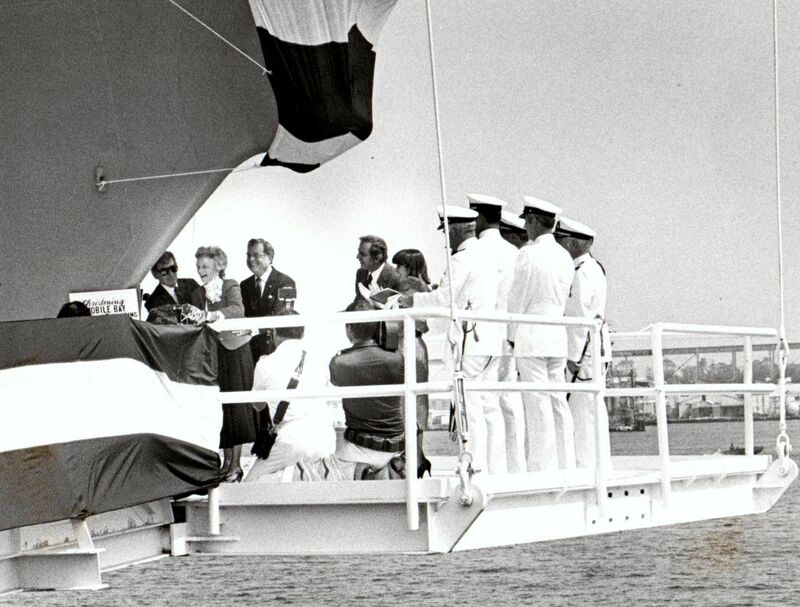 U.S. Navy photo #031011-N-9214D-018 by PH2 Juan E. Diaz. 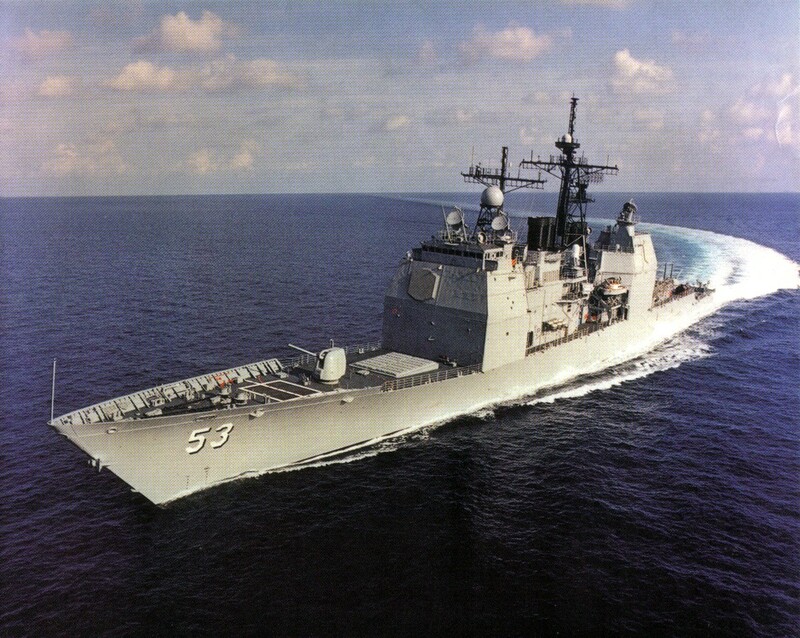 PEARL HARBOR, Hawaii, 5 July 2006 - The guided-missile cruiser USS Mobile Bay (CG 53) departs Pearl Harbor to participate in exercise Rim of the Pacific (RIMPAC) 2006. 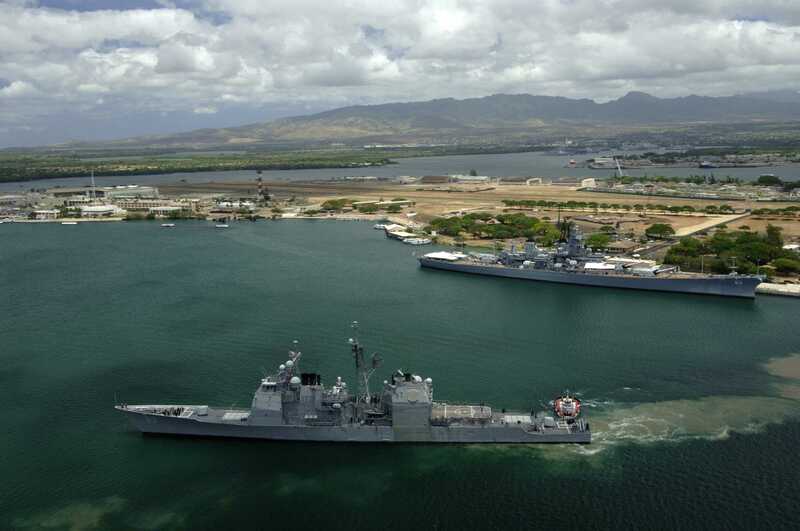 Eight nations are participating in RIMPAC 2006, the world's largest biennial maritime exercise. 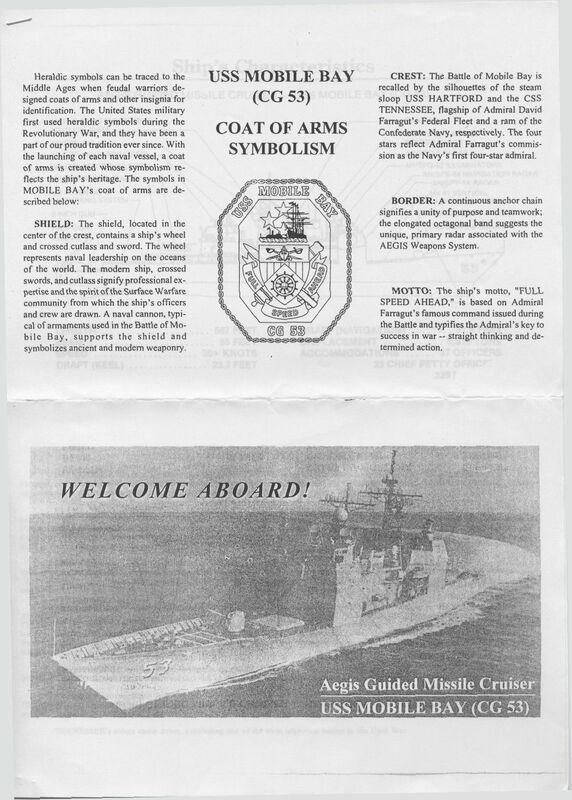 Conducted in the waters off Hawaii, RIMPAC 2006 brings together military forces from Australia, Canada, Chile, Peru, Japan, the Republic of Korea, the United Kingdom and the United States. 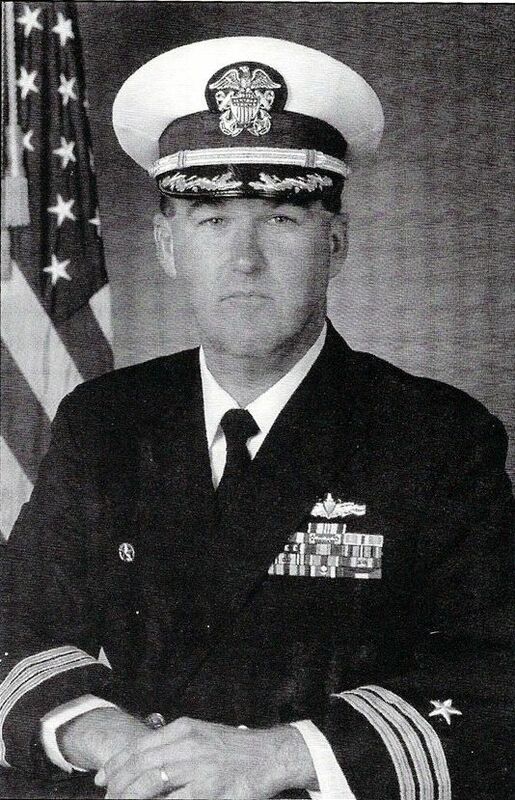 U.S. Navy photo #060705-N-8629M-044 by Mass Communication Specialist 2nd Class Rebecca J. Moat. 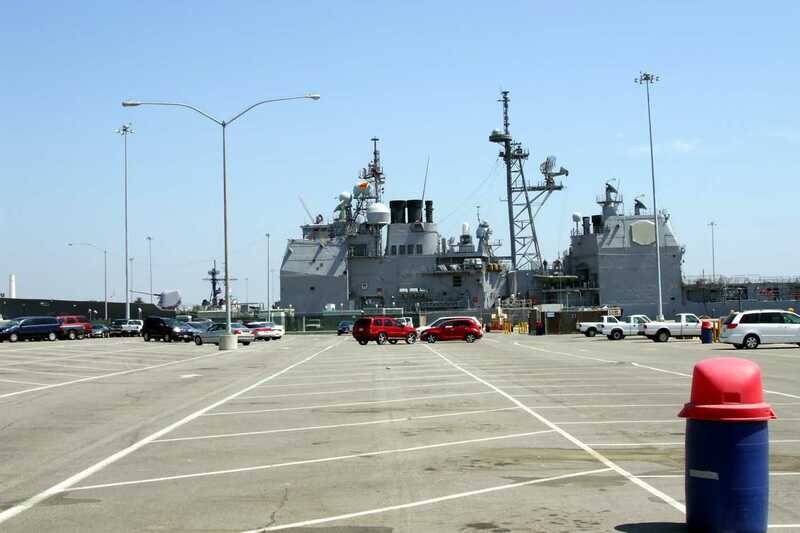 SAN DIEGO, CA, 4 August 2006 - The guided-missile cruiser USS Mobile Bay (CG 53) returns to Naval Station San Diego after completing a regular scheduled deployment in support of the global war on terrorism and maritime security operations. 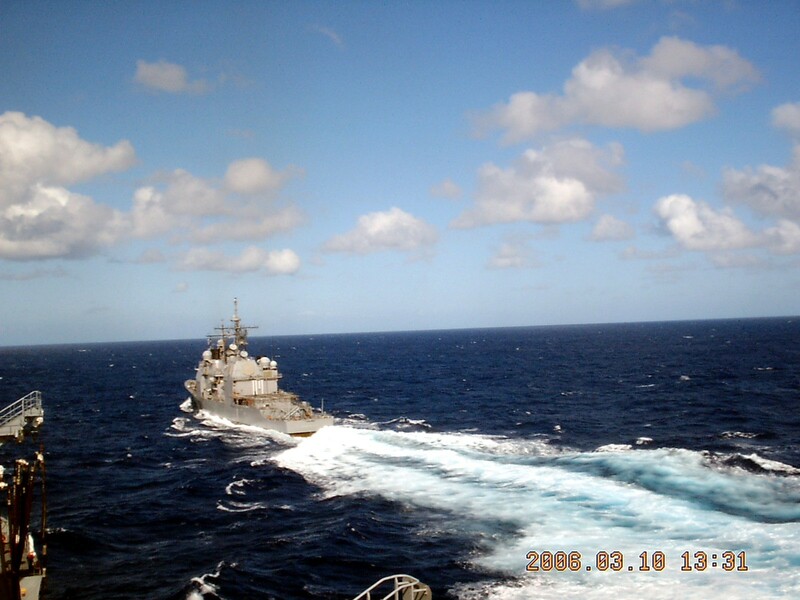 U.S. Navy photo #060804-N-1328S-062 by Mass Communication Specialist Seaman James Seward. 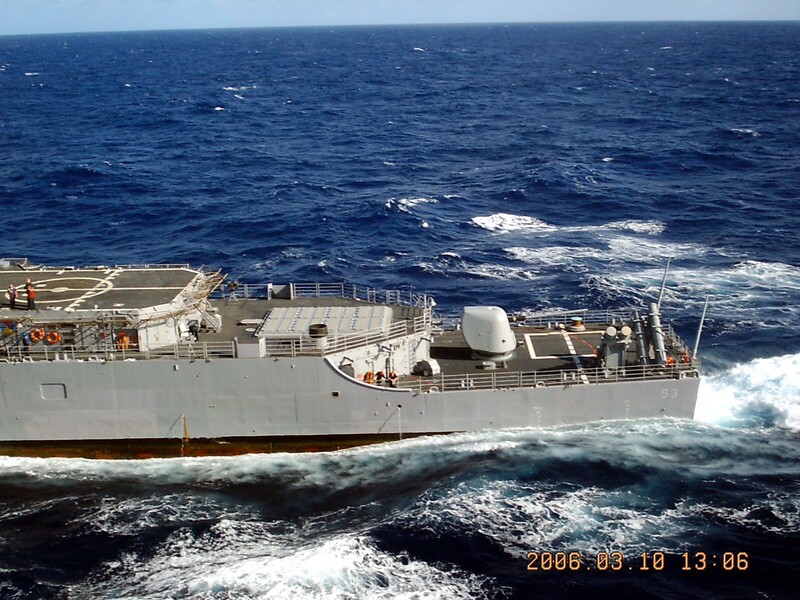 PACIFIC OCEAN, 12 April 2008 - An SH60B, assigned to the "Saberhawks" of Helicopter Anti-Submarine Squadron (HSL) 47, flies over the Ticonderoga class cruiser USS Mobile Bay (CG 53) during a strait transit exercise with the Abraham Lincoln Carrier Strike Group (CSG) 9 as it transits the Philippine Straits. 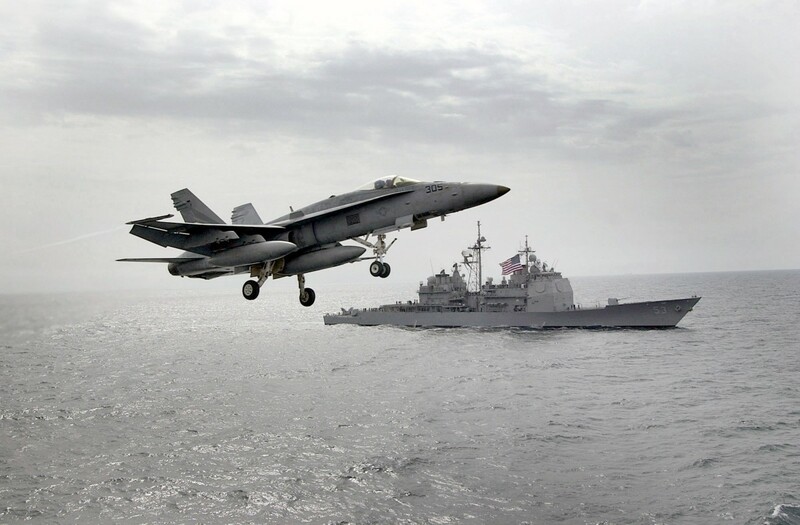 Lincoln and embarked Carrier Air Wing(CVW) 2 are on a scheduled seven-month deployment to the U.S. 5th Fleet area of responsibility. 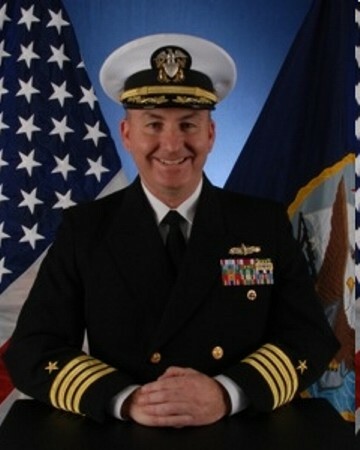 U.S. Navy photo #080412-N-8539M-007 by Mass Communication Specialist 2nd Class Nicholas B. Morton. INDIAN OCEAN, 22 April 2008 - An F/A-18F Super Hornet assigned to the "Bounty Hunters" of Strike Fighter Squadron (VFA) 2 performs a fly-by over the Ticonderoga-class guided-missile cruiser USS Mobile Bay (CG 53) and the Arleigh Burke-class guided-missile destroyer USS Shoup (DDG 86) during an air show for the Nimitz-class aircraft carrier USS Abraham Lincoln (CVN 72) and her crew. 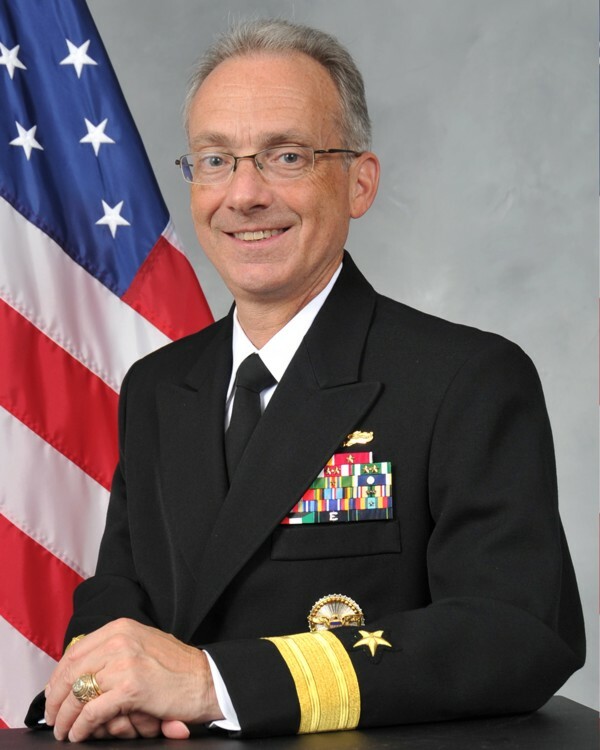 Lincoln and Carrier Strike Group (CSG) 9 are on a scheduled seven-month deployment to the U.S. 5th Fleet area of responsibility. 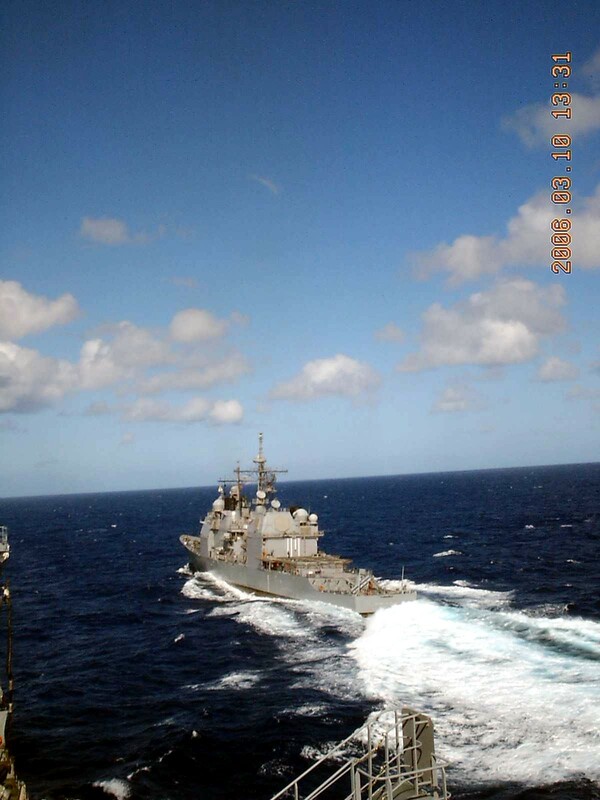 U.S. Navy photo #080422-N-5384B-116 by Mass Communication Specialist 3rd Class Justin R. Blake. 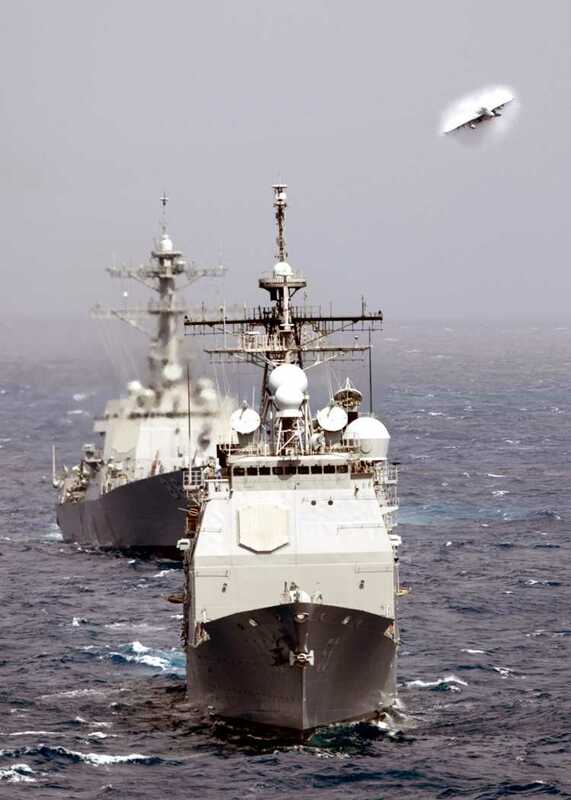 INDIAN OCEAN, 22 April 2008 - The Ticonderoga-class guided-missile cruiser USS Mobile Bay (CG 53) and the Arleigh Burke-class guided-missile destroyer USS Shoup (DDG 86) participate in a pass and review during an air power demonstration held for the Nimitz-class aircraft carrier USS Abraham Lincoln (CVN 72) and her crew. 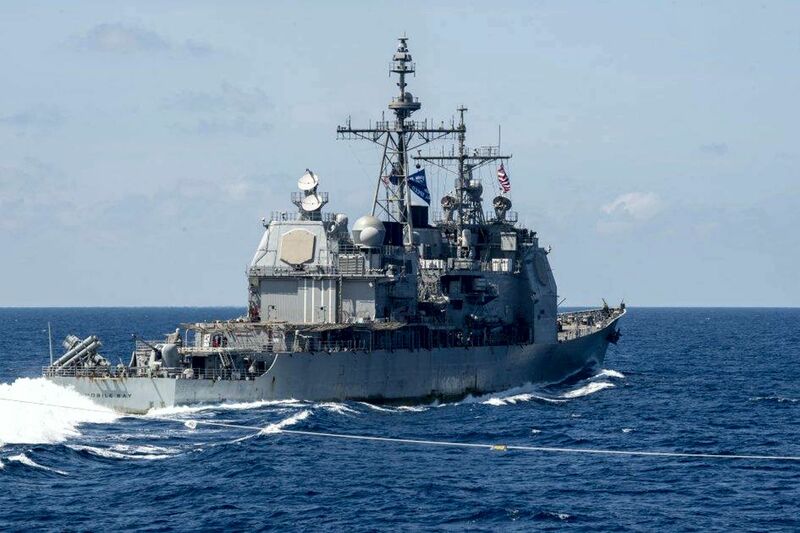 Lincoln and Carrier Strike Group (CSG) 9 are on a scheduled seven-month deployment to the U.S. 5th fleet area of responsibility. 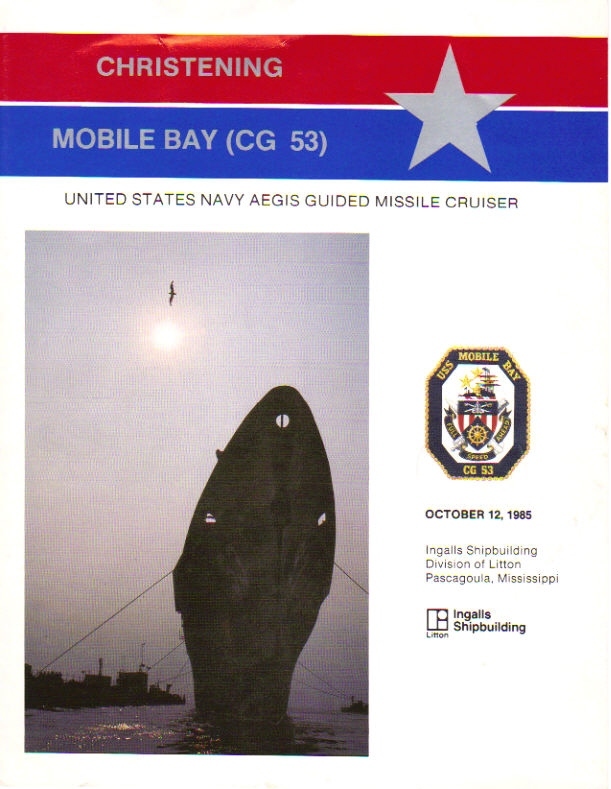 U.S. Navy photo #080422-N-9450M-078 by Mass Communication Specialist Third Class Johndion L. Magsipoc. 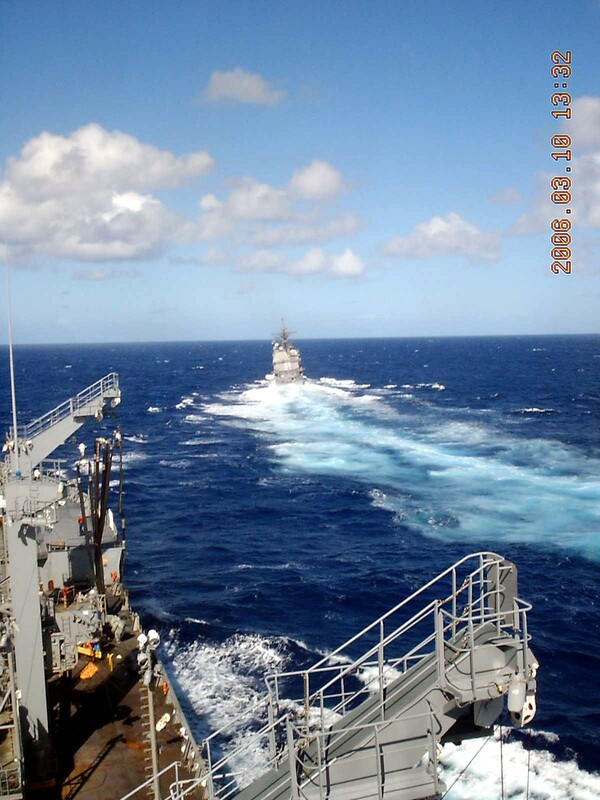 INDIAN OCEAN, 22 April 2008 - The Ticonderoga-class guided-missile cruiser USS Mobile Bay (CG 53) and the Arleigh Burke-class guided-missile destroyer USS Shoup (DDG 86) steam in the Indian Ocean as part of the Abraham Lincoln Carrier Strike Group. U.S. Navy photo #080422-N-6139L-830 by Mass Communication Specialist 3rd Class Quinn Liford. 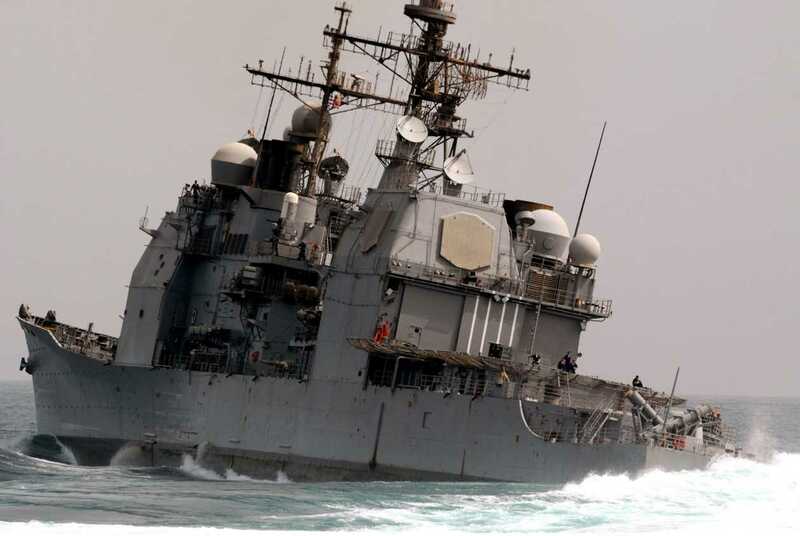 NORTH ARABIAN SEA, 23 July 2008 - A port beam view of the Ticonderoga-class guided-missile cruiser USS Mobile Bay (CG 53) as she steams through the North Arabian Sea supporting the Nimitz-class aircraft carrier USS Abraham Lincoln (CVN 72). 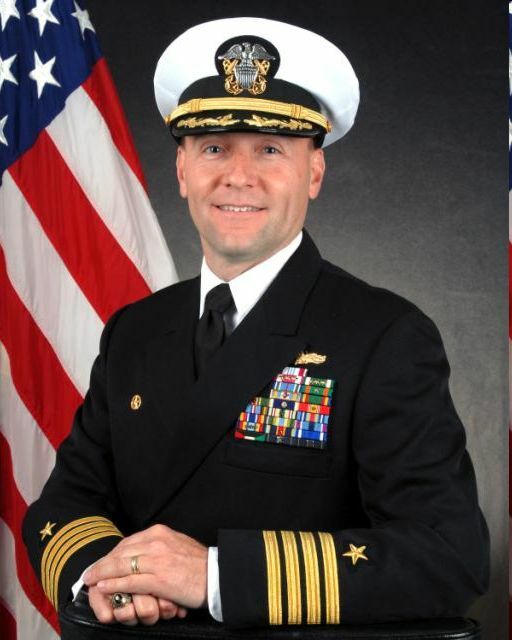 Lincoln is deployed to the U.S. 5th Fleet area of responsibility to support Operations Iraqi Freedom and Enduring Freedom as well as maritime security operations. 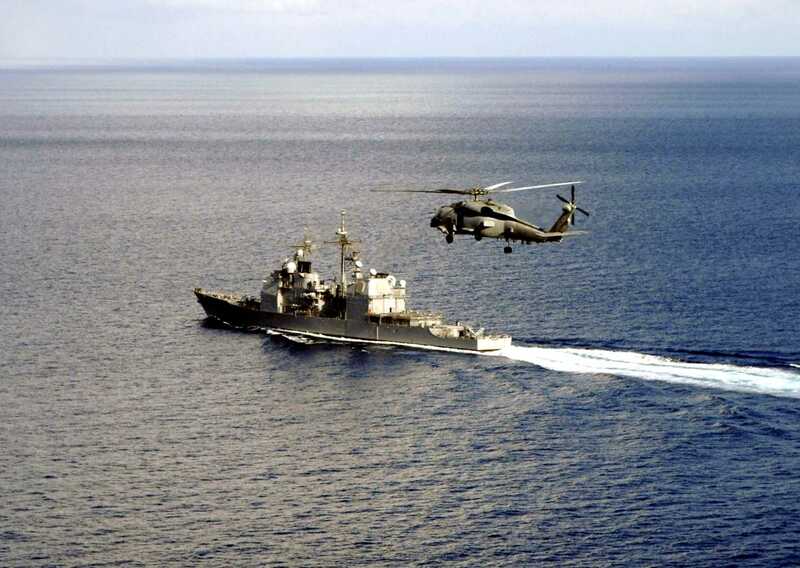 U.S. Navy photo #080723-N-5384B-284 by Mass Communication Specialist Justin R. Blake. 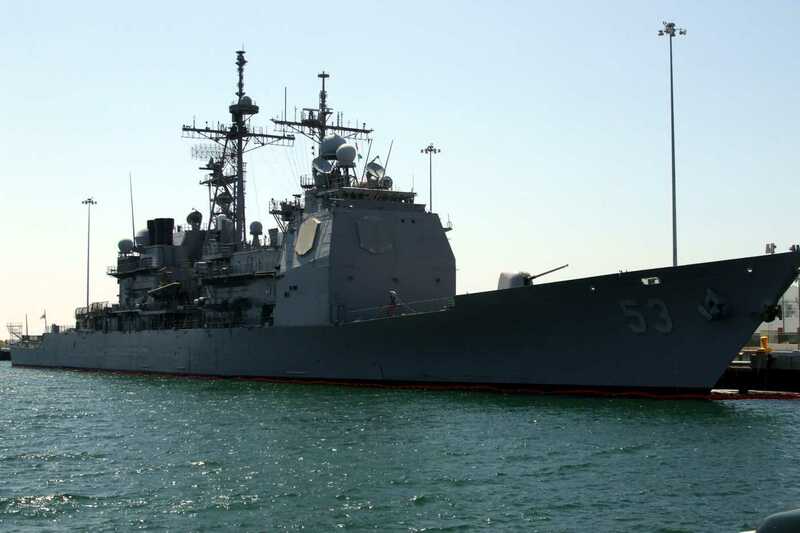 NORTH ARABIAN SEA, 23 July 2008 - A port quarter view of the Ticonderoga-class guided-missile cruiser USS Mobile Bay (CG 53) as she steams through the North Arabian Sea supporting the Nimitz-class aircraft carrier USS Abraham Lincoln (CVN 72). 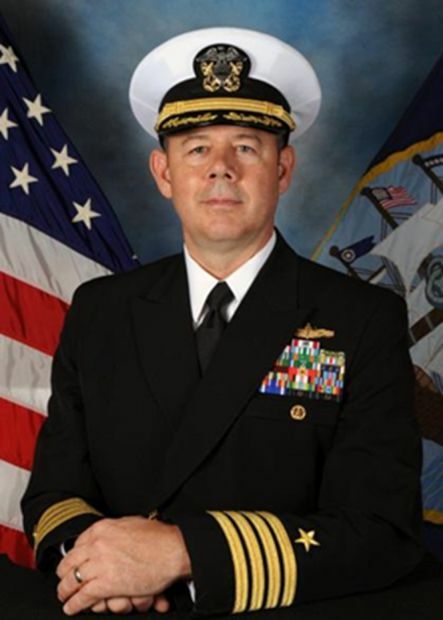 Lincoln is deployed to the U.S. 5th Fleet area of responsibility to support Operations Iraqi Freedom and Enduring Freedom as well as maritime security operations. 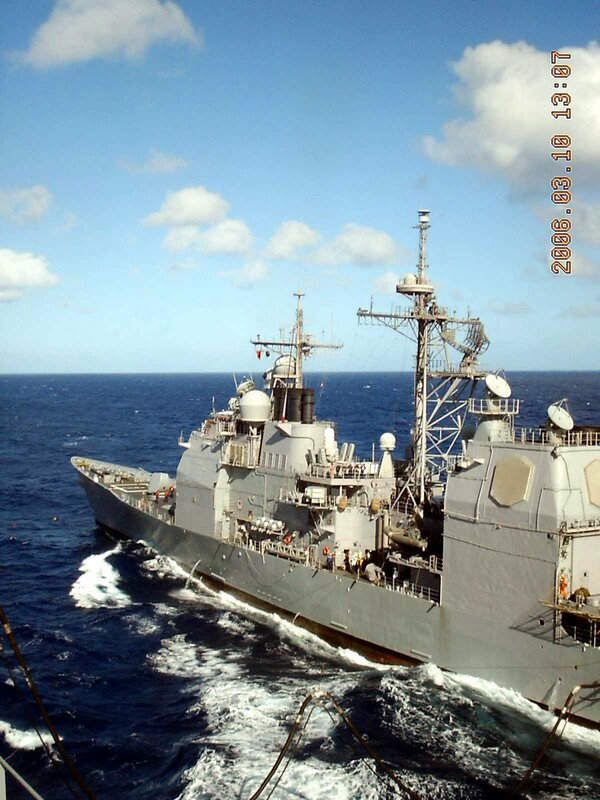 U.S. Navy photo #080723-N-5384B-206 by Mass Communication Specialist Justin R. Blake. 04015331 159k PERSIAN GULF, 22 Nov 2011 - Guided missile cruiser USS Mobile Bay (CG 53) steams behind and was photographed from the aircraft carrier USS John C. Stennis (CVN 74) in the gulf. 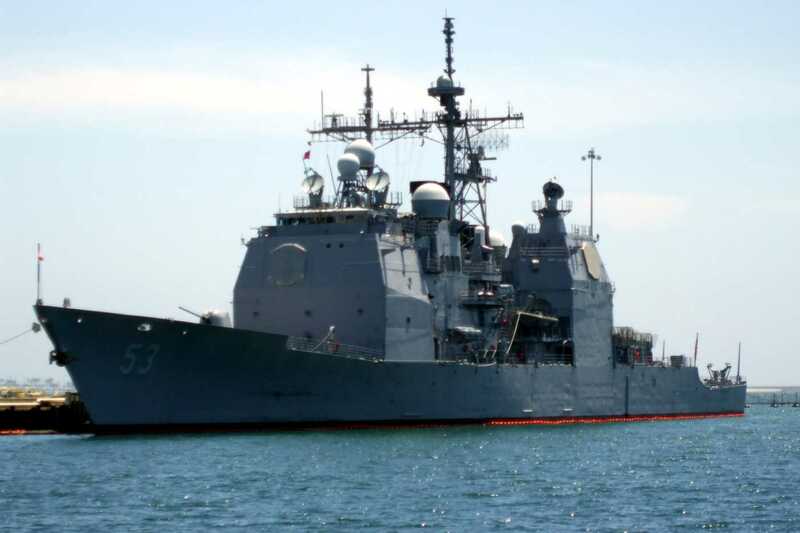 Mobile Bay was deployed to the U.S. 5th Fleet area of responsibility to conduct maritime security operations and support missions as part of operation Enduring Freedom and New Dawn. 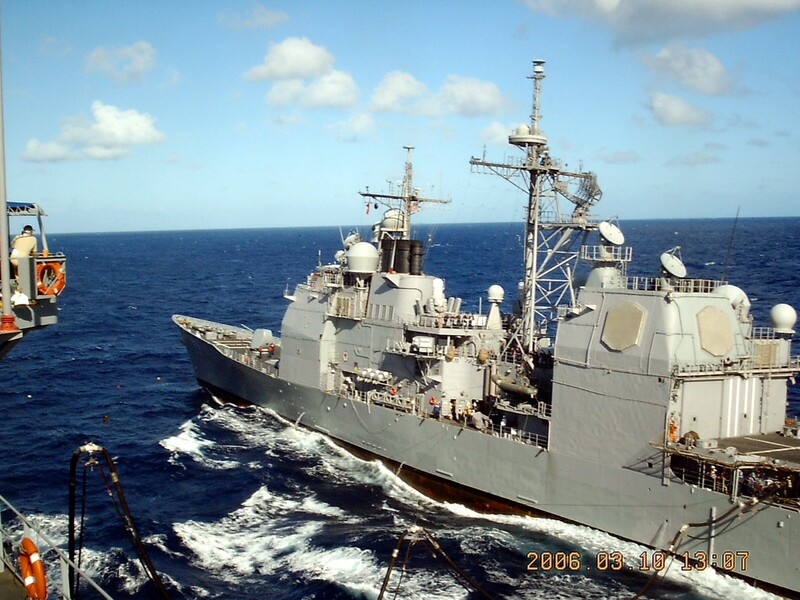 She was attached to the John C. Stennis (CVN 74) battle group. PACIFIC OCEAN 20, September 2012 - The Ticonderoga-class guided-missile cruiser USS Mobile Bay (CG 53) and the aircraft carrier USS John C. Stennis (CVN 74) are underway after completing Valiant Shield 2012 (VS12). 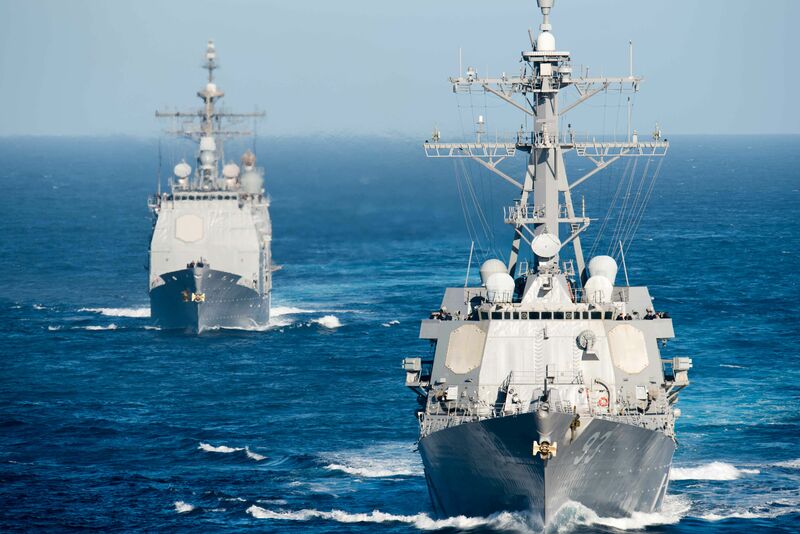 VS12 is an integrated joint training exercise that offers the opportunity to integrate Navy, Air Force and Marine Corps forces at sea. 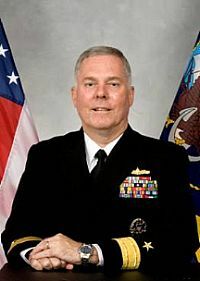 U.S. Navy photo #120920-N-MH885-032 by Mass Communication Specialist 3rd Class Stephanie Smith. 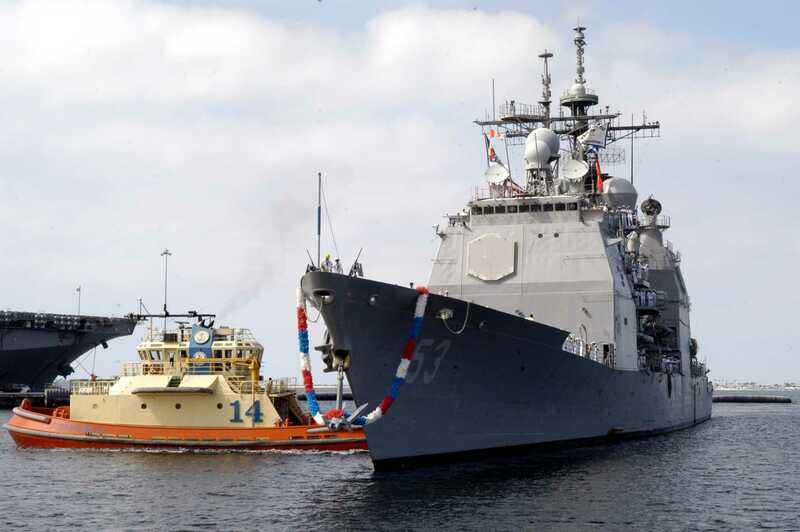 PACIFIC OCEAN, 4 August 2015 - The guided-missile destroyer USS Chung Hoon (DDG 93), front, and the guided-missile cruiser USS Mobile Bay (CG 53) take part in a show of force demonstration. 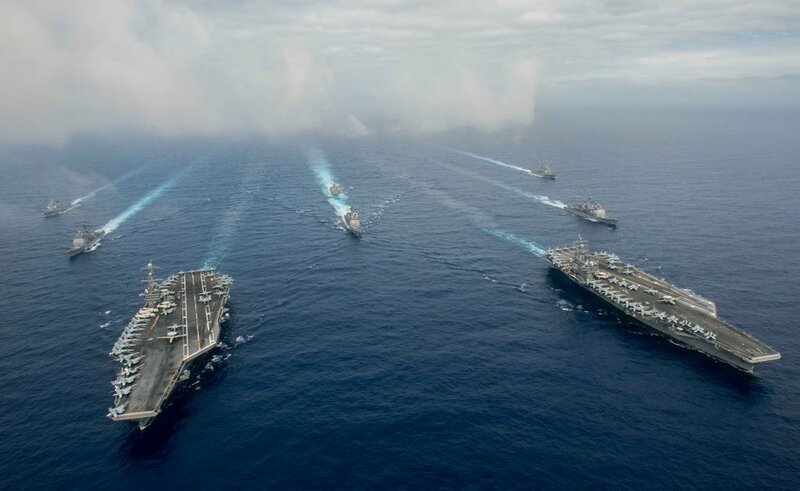 The ships are part of the John C. Stennis Carrier Strike Group and are participating in a composite training unit exercise, the final step before being certified for deployment. 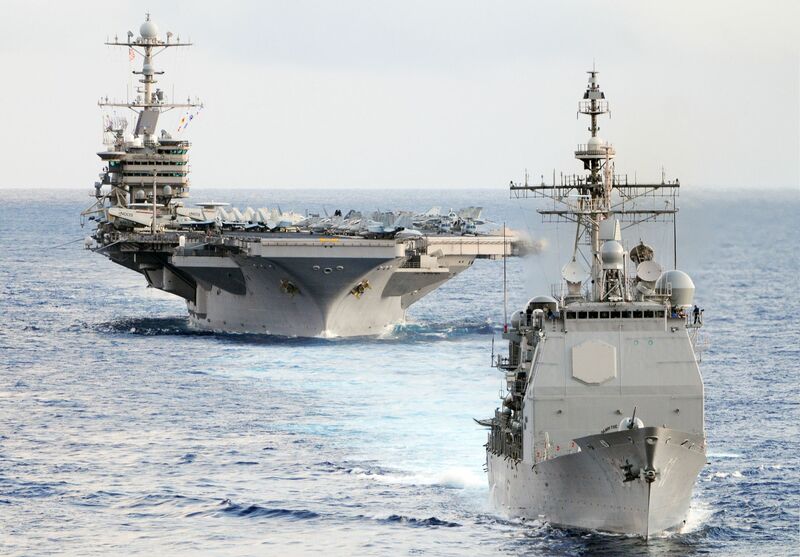 USS John C. Stennis (CVN 74), left, and USS Ronald Reagan (CVN 76) conduct dual aircraft carrier strike group operations in the U.S. 7th Fleet area of operations, 18 June 2016, in support of security and stability in the Indo-Asia-Pacific. 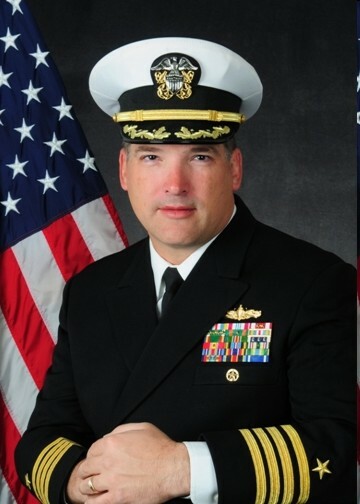 The operations mark the U.S. Navy's continued presence throughout the area of responsibility. 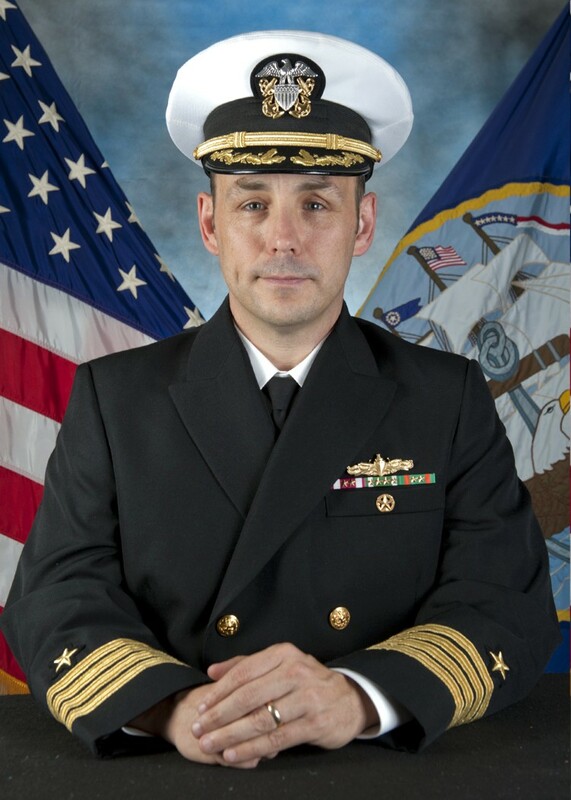 U.S. Navy photo by Mass Communication Specialist 3rd Class Jake Greenberg (# 160618-N-DA693-261). 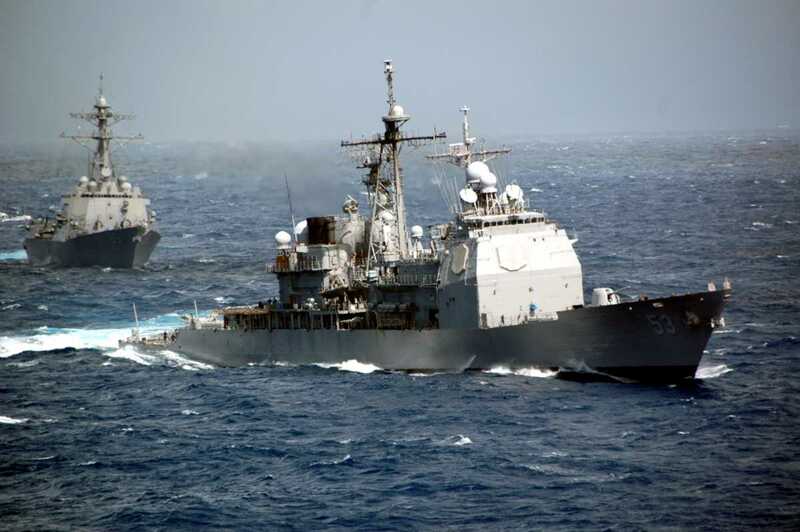 Steaming behind the carriers are three Ticonderoga-class guided missile cruisers, left to right: USS Mobile Bay (CG 53), USS Shiloh (CG 67), and USS Chancellorsville (CG 62). 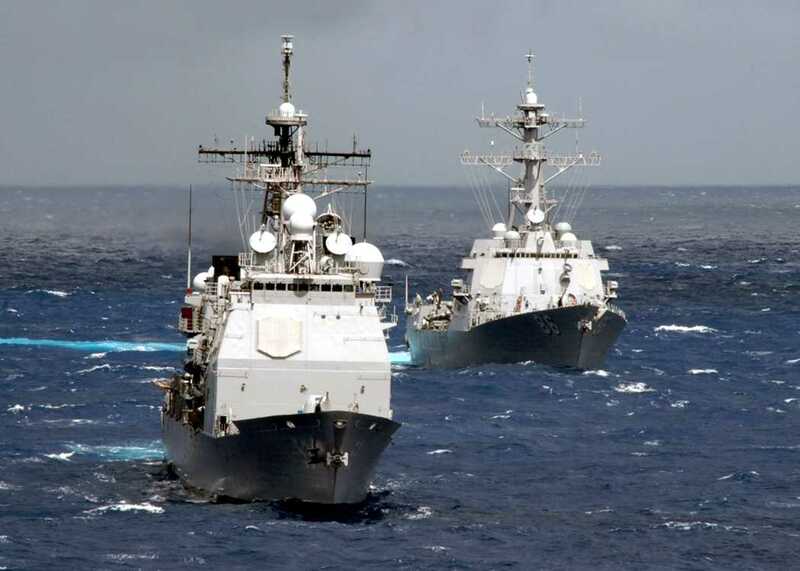 Steaming in the background are three Arleigh Burke-class destroyers, believed to be, left to right: USS McCampbell (DDG 85), USS Curtis Wilbur (DDG 54), and USS Benfold (DDG 65). 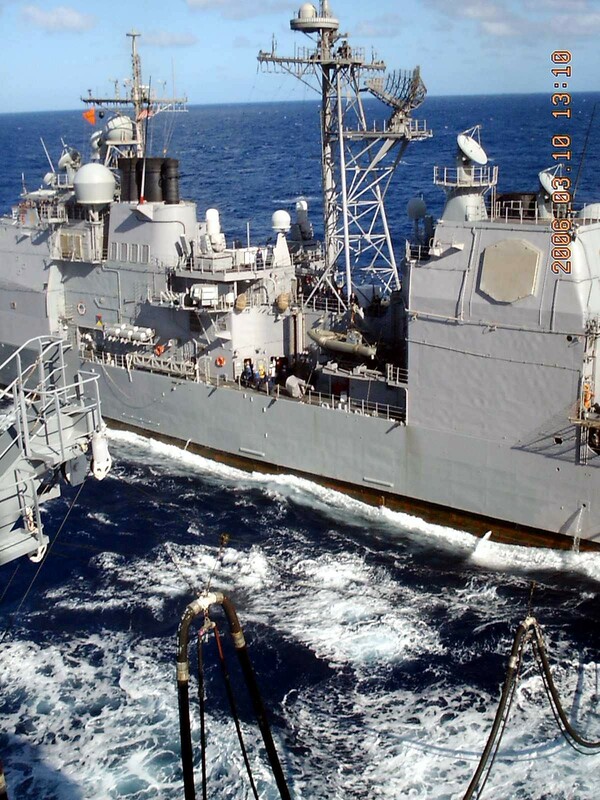 PACIFIC OCEAN, 3 March 2019 - The guided-missile cruiser USS Mobile Bay (CG 53) breaks away from the fleet replenishment oiler USNS Walter S. Diehl (T-AO 193) during a replenishment-at-sea in the South China Sea, 3 March 2019. 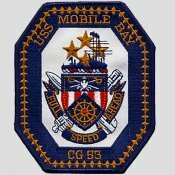 Mobile Bay is part of the John C. Stennis Carrier Strike Group and is deployed to the U.S. 7th Fleet area of operations in support of security and stability in the Indo-Pacific region. 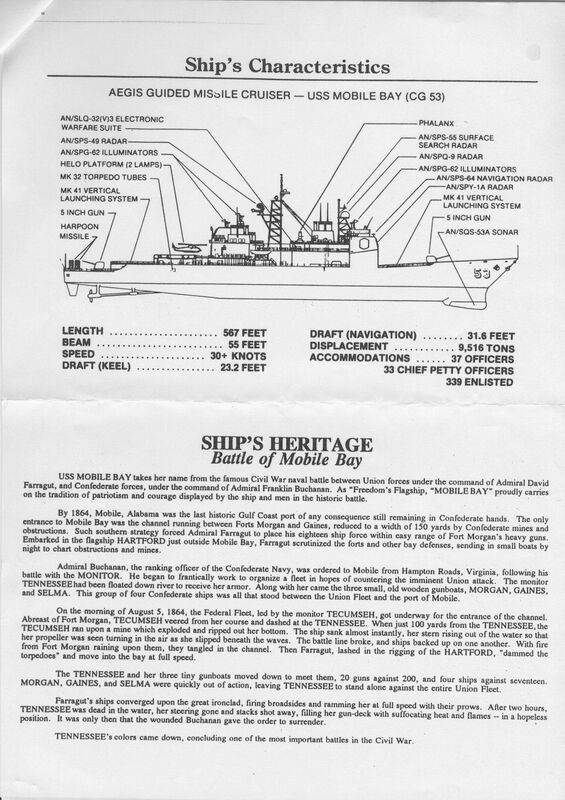 Official USS Mobile Bay (CG 53) website.